Publisher: The Temple Press, exact date unknown, but no later than 1939. Condition: Hardcover, blue cloth. Wear and tear on spine, interior is good but with severe browning on title page. Sporadic foxing. 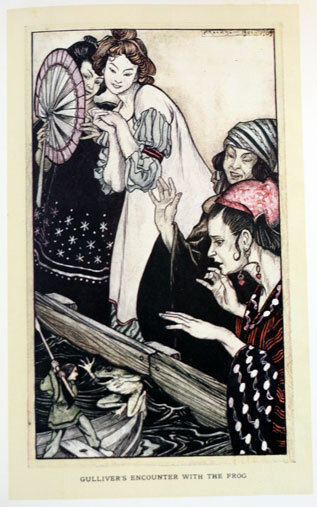 With the fantastic illustrations of Arthur Rackham. 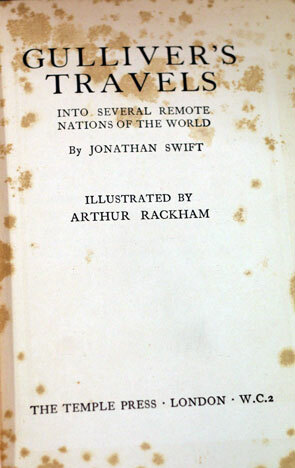 The book is a novel by Irish writer and clergyman Jonathan Swift and a classic of English literature. First published in 1726, it has never been out of print, and has proven to be extremely popular with children. 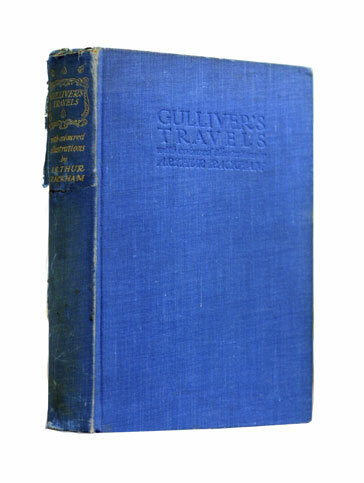 The book begins with a very short preamble in which Gulliver, in the style of books of the time, gives a brief outline of his life and history prior to his voyages. He enjoys travelling, although it is that love of travel that is his downfall. 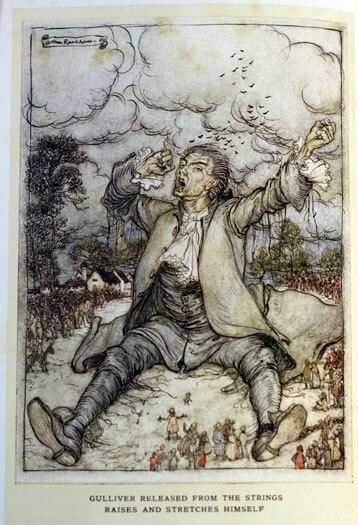 On his first voyage, Gulliver is washed ashore after a shipwreck and awakes to find himself a prisoner of a race of people one-twelfth the size of normal human beings, less than 6 inches (15 cm) high, who are inhabitants of the neighbouring and rival countries of Lilliput and Blefuscu. After giving assurances of his good behaviour, he is given a residence in Lilliput and becomes a favourite of the court. 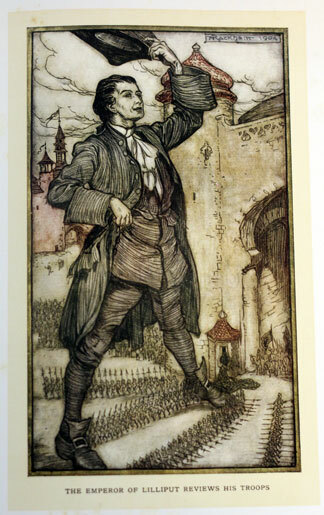 From there, the book follows Gulliver’s observations on the Court of Lilliput. He is also given the permission to roam around the city on a condition he not harm their subjects. Gulliver assists the Lilliputians to subdue their neighbours the Blefuscudians by stealing their fleet. However, he refuses to reduce the country to a province of Lilliput, displeasing the King and the court. 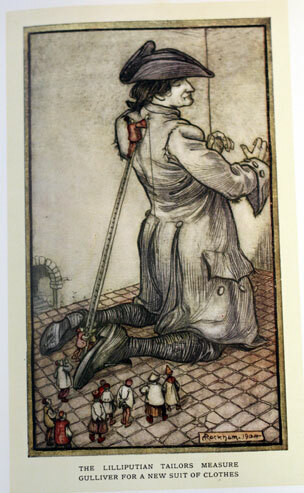 Gulliver is charged with treason and sentenced to be blinded. With the assistance of a kind friend, Gulliver escapes to Blefuscu, where he spots and retrieves an abandoned boat and sails out to be rescued by a passing ship which safely takes him back home. The building of residence that Gulliver is given in Lilliput is of note, as in this section he describes it as a temple in which there had some years ago been a murder and the building had been abandoned! When the sailing ship Adventure is steered off course by storms and forced to go in to land for want of fresh water, Gulliver is abandoned by his companions and found by a farmer who is 72 feet (22 m) tall (the scale of Lilliput is approximately 1:12; of Brobdingnag 12:1, judging from Gulliver estimating a man’s step being 10 yards (9.1 m)). He brings Gulliver home and his daughter cares for Gulliver. The farmer treats him as a curiosity and exhibits him for money. The word gets out and the Queen of Brobdingnag wants to see the show. She loves Gulliver and he is then bought by her and kept as a favourite at court. Since Gulliver is too small to use their huge chairs, beds, knives and forks, the queen commissions a small house to be built for Gulliver so that he can be carried around in it. This is referred to as his “travelling box.” In between small adventures such as fighting giant wasps and being carried to the roof by a monkey, he discusses the state of Europe with the King. The King is not impressed with Gulliver’s accounts of Europe, especially upon learning of the usage of guns and cannons. On a trip to the seaside, his travelling box is seized by a giant eagle which drops Gulliver and his box right into the sea where he is picked up by some sailors, who return him to England. After Gulliver’s ship is attacked by pirates, he is marooned close to a desolate rocky island, near India. Fortunately he is rescued by the flying island of Laputa, a kingdom devoted to the arts of music and mathematics but unable to use them for practical ends. Laputa’s method of throwing rocks at rebellious surface cities also seems the first time that aerial bombardment was conceived as a method of warfare. While there, he tours the country as the guest of a low-ranking courtier and sees the ruin brought about by blind pursuit of science without practical results, in a satire on bureaucracy and the Royal Society and its experiments. At The Grand Academy of Lagado great resources and manpower are employed on researching completely preposterous and unnecessary schemes such as extracting sunbeams from cucumbers, softening marble for use in pillows, learning how to mix paint by smell, and uncovering political conspiracies by examining the excrement of suspicious persons (see muckraking). Gulliver is then taken to Balnibarbi to await a Dutch trader who can take him on to Japan. While waiting for passage, Gulliver takes a short side-trip to the island of Glubbdubdrib, where he visits a magician’s dwelling and discusses history with the ghosts of historical figures, the most obvious restatement of the “ancients versus moderns” theme in the book. In Luggnagg he encounters thestruldbrugs, unfortunates who are immortal, but not forever young, but rather forever old, complete with the infirmities of old age and considered legally dead at the age of eighty. After reaching Japan, Gulliver asks the Emperor “to excuse my performing the ceremony imposed upon my countrymen oftrampling upon the crucifix“, which the Emperor grants. Gulliver returns home, determined to stay there for the rest of his days. Despite his earlier intention of remaining at home, Gulliver returns to the sea as the captain of a merchantman as he is bored with his employment as a surgeon. 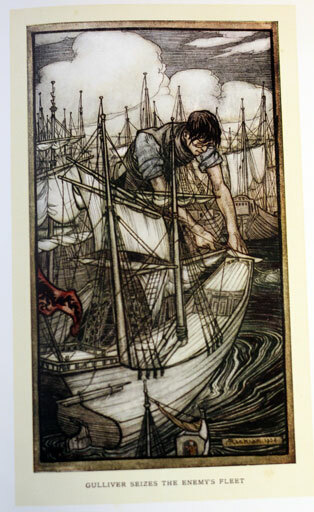 On this voyage he is forced to find new additions to his crew who he believes to have turned the rest of the crew against him. His crew then mutiny, and after keeping him contained for some time resolve to leave him on the first piece of land they come across and continue as pirates. He is abandoned in a landing boat and comes first upon a race of (apparently) hideous deformed and savage humanoid creatures to which he conceives a violent antipathy. Shortly thereafter he meets a horse and comes to understand that they call themselves Houyhnhms(which in their language means “the perfection of nature”), and that they are the rulers, while the deformed creatures called Yahoos are human beings in their base form. Gulliver becomes a member of the horse’s household, and comes to both admire and emulate the Houyhnhnms and their lifestyle, rejecting his fellow humans as merely Yahoos endowed with some semblance of reason which they only use to exacerbate and add to the vices Nature gave them. However, an Assembly of the Houyhnhnms rules that Gulliver, a Yahoo with some semblance of reason, is a danger to their civilization, and expels him. He is then rescued, against his will, by a Portuguese ship, and is surprised to see that Captain Pedro de Mendez, a Yahoo, is a wise, courteous and generous person. He returns to his home in England, but he is unable to reconcile himself to living among Yahoos and becomes a recluse, remaining in his house, largely avoiding his family and his wife, and spending several hours a day speaking with the horses in his stables.